Home > Firearm Accessories > The Horizon - Semi-Automatic Pistol Holster Pocket 1.5"-2"
The Horizon is a small sub-compact or pocket pistol holster designed to be worn on the belt. 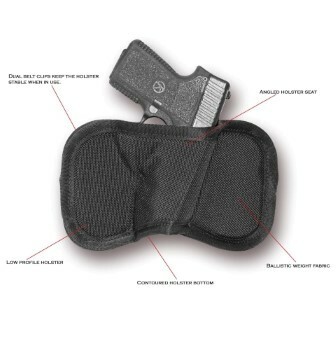 This holster has wide-offset clip style belt loops allowing the user to take the holster off without the need to slide the holster off the belt. Takes advantage of our 3D pancake holster design. Fits most pistols with 1 1/2 to 2 barrel.